The combat system is back to basics, yet oddly satisfying. 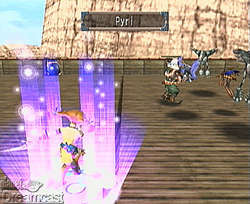 Skies of Arcadia also features a secondary combat system that kicks in when you encounter an enemy airship. Rather than a standard party vs. party fight, you'll engage in deadly, ship to ship combat. These sequences play out quite differently from regular battles, as you have to program commands up to four turns ahead of time, then sit back and watch them unfold. The key here is to predict what the enemy will do and attempt to counteract it. Unfortunately, much of the strategy is often obviated by your vessel's very powerful super weapon, which can be unleashed a few rounds into most fights. For most of the game, one or two blasts of this weapon will annihilate all but the toughest of enemy ships, making the ship to ship battles unnecessarily easy. Still, these skirmishes are a nice change of pace from the standard encounters, and certainly a fresh and innovative approach to combat. On the aural side of things, the soundtrack is a fairly satisfying collection of synth-based tunes. In terms of sheer godliness it doesn't really compare to my all-time favorite RPG soundtracks (Final Fantasy IV is my fave, if you care), but almost every track is high quality and well-suited to its situation. There are a few standouts. The title screen music (which you can hear in the ODCM demo) is beautiful, and the energetic theme of your flagship later in the game is inspiring. It's also neat how the standard boss theme turns upbeat and cheerful when the battle is going in your favor -- nice touch. The final boss's track is somewhat of a disappointment, but other than that the soundtrack is very well done. It's not quite a classic, but it's certainly a very solid effort that conveys the game's heroic tone and has some memorable themes that could be built on in a sequel. Finally, the game is pleasingly long. It's no Xenogears, but I put 58 solid hours into it and still missed a bunch of stuff. While it's possible to rush through the game and finish it much faster, that's solely at your discretion. There's a lot more to do if you take your time. Random battles are a staple of the RPG genre, but some games take them too far. 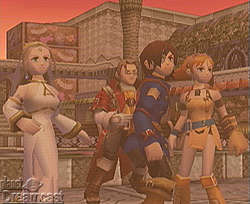 Skies of Arcadia is in danger of this sin, with it sort of toeing the line between acceptable and excessive. When you're on foot, the encounter rate seems pretty normal. You wouldn't want it any higher, mind you, but it's acceptable. The problem comes when you hop in your airship and try to traverse the overworld. Encounters seem far more frequent here, which can be a pain when you're just trying to get from one city to another. However, where it becomes incredibly maddening is when you're looking for Discoveries. Seeing as this is the age of exploration, numerous undiscovered relics of past civilizations are waiting to be found by eager explorers, and the Sailors Guild that's found in most towns will pay handsomely for information concerning these. The problem is, you have to trawl every little piece of the vast overworld to find these landmarks, and while you're doing this you'll be harassed by enemies nearly every step of the way. It's absolutely maddening to have your searches interrupted with constant little 90 second battles. What's worse, a handful of Discoveries are mandatory, so this aggravating little ritual is almost required at a few points in the game. Continuing in this area, the overworld flight sequences could use a bit more polish. The framerate can sometimes dip into the teens with some accompanying massive slowdown, and the graphics overall aren't quite as detailed or pleasing as in every other area of the game. Further, the clipping box on your craft seems to be a bit oversized, so it will often happen that you can't pass by an obstacle that you think you should be able to clear. You then have to back up a bit, possibly adjust your altitude, and then try to take another pass at going on your merry way. Of course, enemies like to attack you at just this very moment, leading to an "ARGH!" and a creeping dislike of mid-flight course corrections. Another annoyance is the English voice dubbing, which more often than not is rather lacking. I can see why Sega would want to dub the Japanese speech into English, but I fail to see why they had to replace it completely. Since speech is only used for calling out attacks and key moments of dialogue, I don't see why they couldn't have left in the Japanese voices as an option for those of us who dislike ear bleeds. As it is, at several points in the game I was jarred out of an important story sequence due to a poor bit of voice work, such as Aika's too-loud, off-key laugh. While speech is rather rare in Skies, what's there often leaves something to be desired. I came into this game with modest expectations, and was rewarded with the most enjoyable RPG experience I've had in years. OverWorks has broken away from the pack with this one, and should be commended for breathing some originality into what is well on its way to becoming a tired genre. If you're hungering for a story-driven RPG, Skies is everything you would hope it to be, and probably more. Best console RPG of the year? I wouldn't rule it out. Highs: Outstanding scenario and characters, great graphics and gameplay, very good music, long. Lows: Little challenge, slightly excessive encounter rate, typical voice acting, over-reliance on special moves. Other: 1 Player, VMU Compatible (27 blocks per save, 83 blocks for optional mini-game), Jump Pack Compatible, VGA Box Compatible.